A cannabis-waste startup has been selected to receive a $250,000 grant from Colorado to find aftermarket uses for hemp and marijuana waste. 9Fiber of Silver Spring, Maryland, plans to process waste hemp and marijuana stalks for industrial purposes such as bioplastics, construction materials and animal bedding. The company expects to start operations in Pueblo, Colorado, in late 2019 or early 2020. “Our mission is to revive the U.S. hemp fiber market through processing of the waste streams of the current cannabis and hemp industries,” 9Fiber CEO Adin Alai told Hemp Industry Daily. 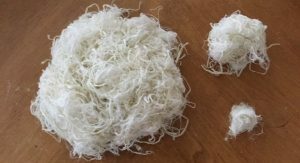 Even though most hemp varieties grown in the U.S. are short plants grown for CBD production, not fiber production, Alai said his company has developed a way to produce marketable fiber products, even textiles. Advocates often tout the goal of using every part of each hemp plant to minimize the environmental impact of unusable waste. The current domestic hemp-fiber market is tiny, Alai said. But 9Fiber plans to approach U.S. companies importing hemp products to pitch them on using domestic hemp waste instead. “We’re really going out there and defining the market, making the market,” he said. This award marks the program’s the first grant to a cannabis company that doesn’t conduct medical research. New York and Kentucky have also used tax dollars to support startup hemp manufacturers. 9Fiber said it plans to collect hemp and marijuana stalks from companies that would otherwise have to pay to have the waste removed, then use a chemical process to decorticate the stalks into fiber and hurd, the woody core of a cannabis stalk. The company’s proprietary process removes all traces of THC and CBD from the cannabis waste. Colorado changed its marijuana law earlier this year to allow marijuana “fibrous waste” to be recycled, not just destroyed. But the waste can be used only for “industrial fiber products,” not human consumption. Previously, cannabis waste had to be rendered unrecognizable. Alai said his company will accept waste from both marijuana and hemp – but only if the plants are legal in that state. That is great news about recycling hemp waste into industrial products, it’s about time! I’m a hemp/cannabis advocate artist who uses byproduct hemp dust from the Hempcrete used for construction. It is green eco friendly artwork. I’m looking for corporate sponsors to commission artwork for their corporate offices. I would be happy to create hemp art for the industry corporate leaders as a symbol for recycled hemp & cannabis. I’m open to discussion for commissioned artwork. VT has a booming CBD market for farmers & local start ups. They should look at the North East for a site to process this also. Great idea. We can produce a HempBoard (Trade Mark) that bio waste is pressed into a very stong board that can be used for any product especially furniture, pallets, doors, floors, cabinets and many more. Also, it’s fire retardant, water absorption and BioPerferred Certified by USDA. Contact John Owen 214-708-0682. Great to see alternative businesses within the Hemp/Cannabis industries that bring a positive impact environmentally and financially.